*This section details the modifications done to Work Breakdown Structure form. Added a new menu on the action pane called Activity maintenance – from where the activity maintenance form will open. The activities that are created on the Work Breakdown Structure form will be available on this new form. Activity maintenance form is a new form where the activities defined in the work breakdown structure form will be available after the user publishes the lines onto work breakdown structure. 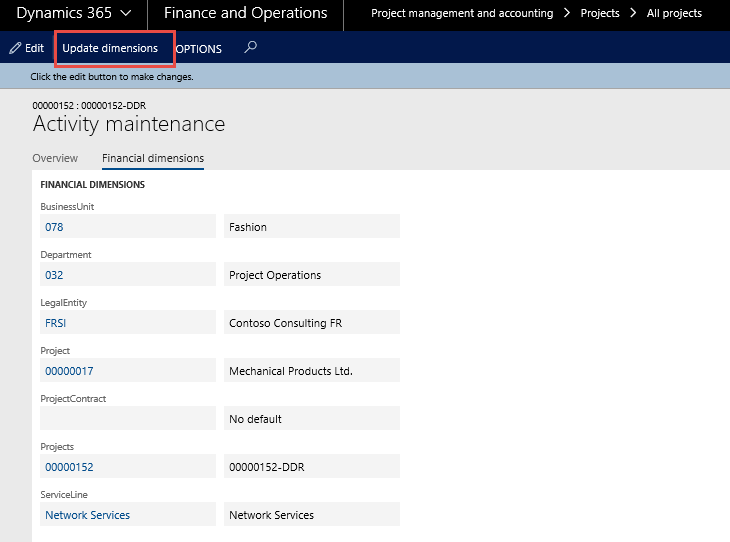 Activity maintenance is available as soon as the work breakdown structure is published for the very first time. Subsequently even when users edit the work breakdown structure form, the Activity maintenance form will be available for users to update the financial dimensions and activity code. WBS ID- Auto generate and not editable by user. Activity number – Same activity number as in WBS – not editable by user. Activity code – Which will be the Manual activity code and will be editable. Activity description field – Will be editable to the user. 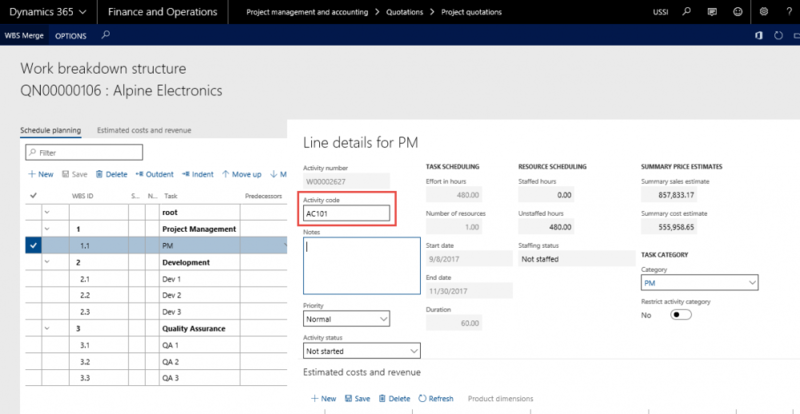 Invoice detail – This checkbox will be editable, marking of this means that the activity roll up will not happen for this activity during Invoicing. This checkbox is in relation to the Invoice enhancements feature. Closed – This checkbox when marked will default the system date in the date and time closed field. Financial dimensions can be updated at once by selecting multiple work breakdown structures and clicking on Update dimension button. Update dimensions bring up the below form, where the user can enter dimensions that is desired to be updated on all the activities. On the Work Breakdown Structure template and Project Quotation the activity code is available on the Details form of the work breakdown structure and the same will be carried over to the quote/project. Even when specified on the Project quotation, the same will be available on the Project work breakdown structure that is created or updated using the Quote to Project wizard.